Can Swiss living abroad vote? Who can vote online? Who can launch an initiative? What is the role of a cantonal government or parliament? Who can stand as a candidate in federal elections, and how? ch.ch/democracy, gives you answers to these and other questions. This site offers a wide range of information dedicated to how the Swiss political system functions. Fresh content and lots of links to external websites of federal, cantonal and communal authorities are brought together on one single website, making it easier and faster to access information on the functioning of the Swiss political system at all political levels. 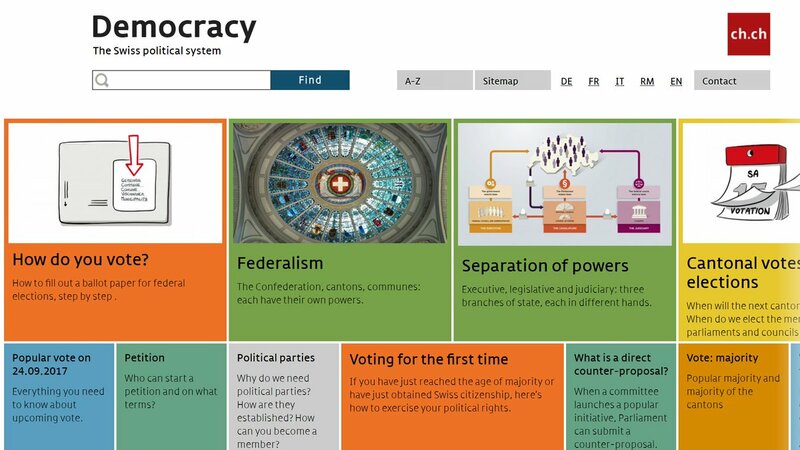 ch.ch/democracy gives useful, practical information explained clearly and simply for all citizens, both in Switzerland and abroad. The new portal is especially useful for Swiss living abroad as it contains information of particular interest, including explanations on how they can exercise their political rights. 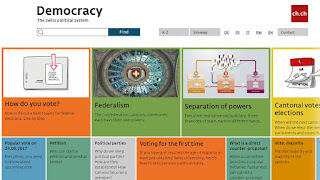 The illustrations, graphics and video clips which augment the explanations in the texts make ch.ch/democracy a dynamic and attractive website for younger citizens too.